Mary Lambert’s “She Keeps Me Warm”: The singer-songwriter’s “Same Love” chorus is now a moving full song. 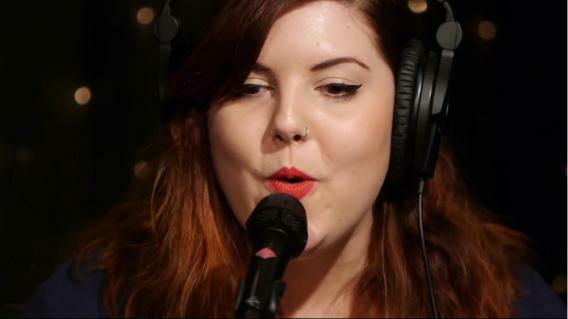 Mary Lambert has expanded her “Same Love” chorus into a new, full song. When I first heard about Macklemore’s pro-gay song “Same Love” a few months ago, I was wary. Though having big-name pop artists like Lady Gaga and Katy Perry sing openly in support of my people in the past few years has been a welcome development, I could never listen to those songs without catching a whiff of commercial opportunism. But “Same Love” proved to be different. Macklemore’s lyrics offered an idiosyncratic perspective on homophobia in hip-hop and American society at large, criticizing both with a mixture of gentleness and firmness that I had not heard before. And most importantly, his support of the gay community felt sincere. Looking back on “Same Love” now that the novelty has worn off, that sincerity seems to emanate in large part from the song’s poignant and hopeful chorus, sung beautifully by Seattle-based artist Mary Lambert (herself an out lesbian). This week, Lambert released a full-length song called “She Keeps Me Warm” that builds on the chorus, expanding her affection for that abstract “she” into a complete, and very moving, love song. I really tried to not be gay at points in my life, but I was (and am) at a point where I refuse to apologize about my identity. I am not sorry about my gayness. I am not sorry I’m a Christian, either, though that’s far less persecuted than my gayness, which is ironically, instigated by the Christian community. “Not crying on Sundays” was a huge lyric for me to write. I cried and cried in church for a year, believing that I was going to Hell, trying to reconcile “the demons”. At some point, it became absurd. I will not apologize for love. And my God, the God that I believe to be true, would never condemn love like this. Knowing the story behind that lyric serves to make both Lambert and Macklemore’s unique variations on the theme that much more powerful—the theme being that, in a just society, love’s natural partner would not be strife and tears, but peace.